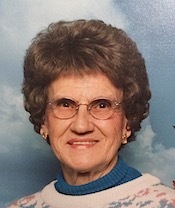 Betty Matthews, age 87, of Alamosa, Colorado, died November 25, 2015. Betty was a long-time resident of Berthoud, Colorado. Betty was born June 13, 1928 in Edgewater, Colorado to Frank Hall and Mabel Hamilton Hall. Betty graduated from Englewood High School in 1945. Betty met Oscar (Buck) Matthews, and they were married in Golden, Colorado on Oct. 31, 1948. Betty and Buck moved to Berthoud in 1958 where they farmed until 1999. Betty enjoyed farm life and being a homemaker. In addition, Betty worked part-time at a variety of jobs including a shopkeeper at the Ideal Spot, which was the convenience store located a mile west of Berthoud. Betty loved to fish in her spare time, and she started a bait business, supplying fisherman with worms and night crawlers. Betty loved to can and freeze fresh produce from the garden, and also enjoyed sewing, knitting and other arts and crafts. Betty was preceded in death by her husband Buck in 2004, her parents, brothers Woodrow, Everett, Johnny, Ira, Howard, and Harding; and sister Bertha. Betty is survived by two sons, Steve (Kathy) Matthews, and Mike Matthews, all of Monte Vista, Colorado; two daughters, Janice (Johnny) Smith of Las Vegas, Nevada, and Pam (Don) Cook of Ft. Collins, Colorado; grandchildren Quinton (Valerie) Gray of Loveland, Colorado, Amy Gray of Las Vegas, Nevada, and Cari Matthews of Evans, Colorado; great-grandchildren Emerie and Gavin; Hailey, Kaytlin, Madison and Nathen; and special friends Pat and Bob Dudley of Longmont, Colorado. Betty is also survived by numerous nieces, nephews, and friends. At Betty’s request, a private memorial service will be held at a later date. Memorial contributions may be made to your favorite charity in memory of Betty. Betty’s family would like to extend a special thank you to the caregivers at The Bridge, Alamosa, Colorado. Previous Story: Colorado’s 4 Seasons: pre-winter, winter, post-winter, construction!